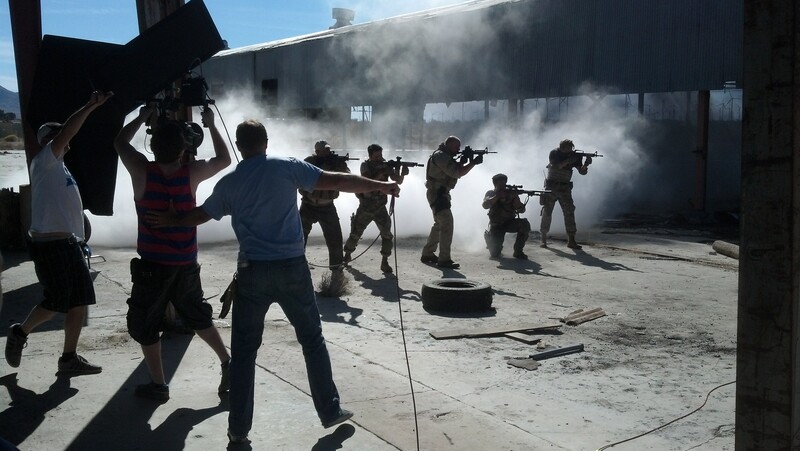 October 27: A film crew Los Angeles came to Mojave last Friday to shoot an action scene for a small independent film. The film, about a video game that comes alive, featured a team of military special operations forces as they jump through smoke and move with technical and tactical precision. The actors were all former Army Rangers and Navy Seals, with multiple combat deployments, and now work in Hollywood on feature films and video games. The film crew consisted of over 20 young film makers and college students, working on a shoe string budget to produce a project they felt passionately about. The scenes were filmed in an abandoned aluminum extruding plant in Mojave, offering one of the most unique locations for a film that is supposed to take place in a war zone. “You can’t find stuff like this anywhere” said the movie’s director, Karl Richter. “This warehouse and the desert backdrop… this location was just perfect.” One actor even suggested that land owners in Mojave advertise their properties in Hollywood, and that Mojave start a catalog of interesting locations here in Mojave. The Mojave Foundation would like to thank Mr. Richter, Russell Greene, and all the staff and actors who came to Mojave to film this movie, and we look forward to helping other film makers find interesting locations here in Mojave to make their movie magic. This entry was posted in Community events on October 27, 2013 by mojavefoundation. Mojave definitely needs to form a some sort of film bureau to attract more of this type of activity. Depending on the size of the budget and amount of time spent on location, the community could see hundreds of thousands of dollars pumped into the local economy with each film. Production companies have a history of using the Mojave Desert for their film locations. They will use the locals for extras, rent homes and businesses, stay in the motels, eat in the restaurants and are usually very generous with the rent payment. Mojave’s location in relation to Hollywood and it’s small town character is a perfect fit. Don’t let this opportunity slip away. Create a film board, build a portfolio of buildings, the neighborhoods, commercial sites, low traffic volume roadways, motels, caterers and any local contractors. Rob, good comment. The opportunity is there for the taking. Go ahead and put some pictures of locations together, and start advertising in Hollywood. You can be the liaison between Mojave and the production companies, and you could charge a modest commission in the process. If you could provide easy access to tables, and tents, and food, you could turn this into a nice little business. No reason you couldn’t get started tomorrow!